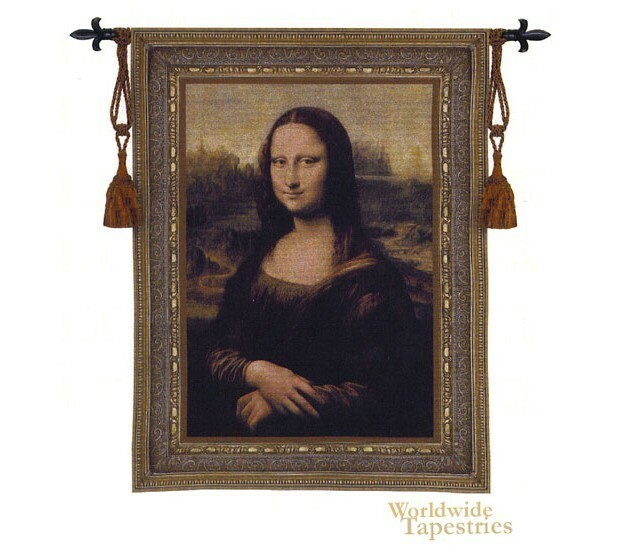 The famous Mona Lisa by da Vinci, also known as La Gioconda, is shown here in this renaissance art tapestry. Considered the most famous painting in the world, the Mona Lisa has taken on a life of its own. The original painting which da Vinci began in 1503 was thought to be a portrait of Lisa del Giocondo who lived in Florence Italy during the Italian Renaissance, and commissioned by her husband. It was eventually in 1514 that it was completed. It was bought by King Francois and then later given to Louis XIV who moved it to Versailles. It has been speculated however that this painting could have been a self portrait of da Vinci, as well as other possible candidates for the inspiration for this work. This work has captured the imagination of the world because of its beauty combined with the 'enigmatic' expression on the face. The era of the 15th and 16th century required that women in art should be portrayed as virtuous which in this piece is by her right hand folded over her left. What is also seen is that there is an absence of facial hair and eyebrows which is not uncommon for women in this era. It is also the first painting known to depict a portrait in front of an imaginary landscape. What is also not commonly known by non scholars of da Vinci's works, is the way that da Vinci structured this work to create interest between the observer and the subject. She is in a pyramid formation with her head forming the top corner and her hands forming the forward corner with the light illuminating the face and hands, the areas of communication, with darker tones in between. A master work by the master artist. This art tapestry is backed with a lining and has a tunnel for easy hanging. Note: tapestry rod and tassels, where pictured, are purchased separately.